1. In a bowl, combine flour, unsweetened cocoa, baking soda and salt then mix well. Set aside. 1. Using an electric mixer, beat butter and sugar until light and fluffy (around 5 minutes). 2. Beat in eggs one at a time then mix in the sour cream, food color, and vanilla. 1. In a muffin pan, line muffin cups then fill-in batter up to 2/3 of the muffin cup. 2. Bake in preheated oven at 300 degrees Fahrenheit for 15 minutes or until done. (Cupcakes is done when a toothpick inserted in the center comes out clean.). Let it cool. 1. In a electric mixer, whip butter on medium speed for 5 minutes or until becomes creamy. 2. Add cream cheese, sour cream, vanilla and salt then keep mixing for another 5 minutes or until becomes light and fluffy. 3. Add sugar then beat until smooth. 4. Scoop and spread the frosting on top of cupcakes. Sprinkle with red velvet crumb. 1. In a saucepan, combine flour, milk, water and sugar then cook in a medium heat. Stir constantly until thickens. 2. Add egg yolks, butter and vanilla extract, cook for another 2-3 minutes or until well blended. Stir well and let it cool, set aside. 1. In a saucepan, pour water and add sugar, cook over low heat until sugar has dissolved. Set aside. 1. In a saucepan, boil water and add unflavored gelatin, pineapple juice and sugar. 2. Simmer until gelatin is dissolved. Set aside. 1. 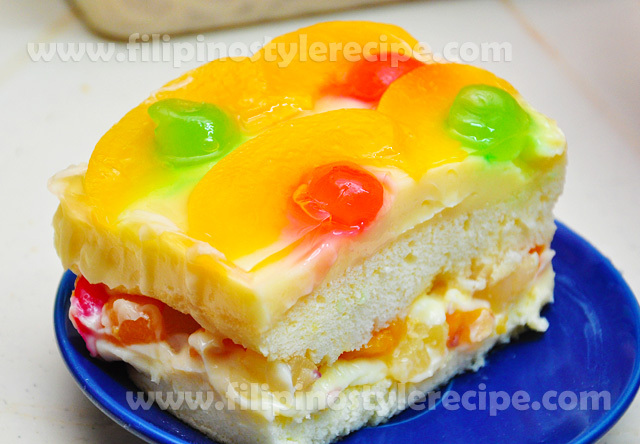 In a rectangular container, arrange 1st layer of sponge cake. 2. Pour half of cake syrup over the sponge cake, spread the custard cream on top and arrange the fruits. 3. Place the 2nd layer sponge cake then repeat step 2. 4. Pour gelatin on top, refrigerate over night or until gelatin is firm. Serve chilled. 1. You may also used fruit cocktail. 2. 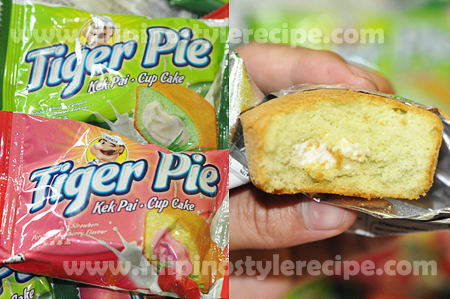 Sponge cake is also available in grocery or bakery stores. (Sponge cake recipe). 2. Top with 4 selected shredded cheese then sprinkle with basil. 1. 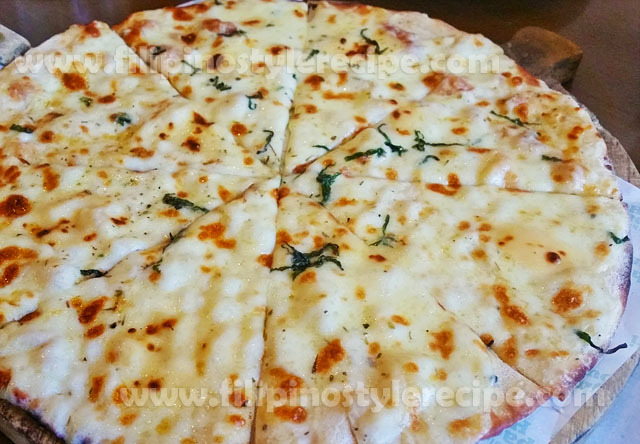 Preheat oven over 400 degrees Fahrenheit then bake for 10-15 minutes or until the crust are crisp and the cheese is melted. 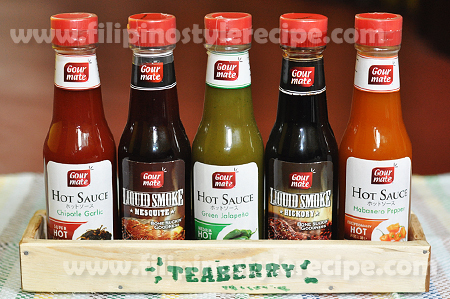 Christmas is just around the corner and you might be planning on what to include on your Noche Buena. 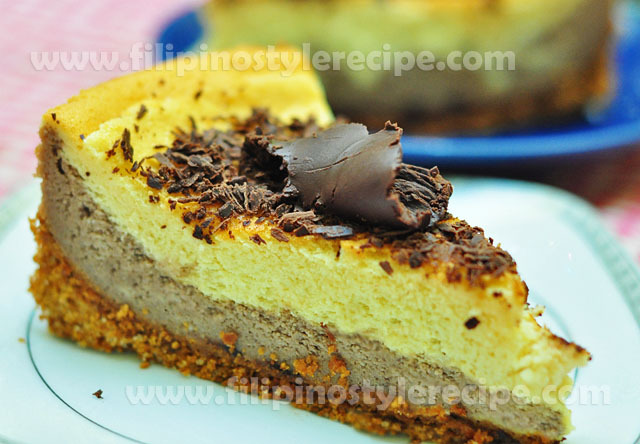 You may consider this cheesecake recipe and prepare it ahead of time (like a day before) and keep in the refrigerator. 1. To prepare the crust, combine the ingredients and press into the bottom of a 9 inch springform pan. Chill in the refrigerator while preparing the filling. 2. In a bowl, beat the cream cheese using an electric mixer until smooth and no lumps remain. Gradually add the sugar until well blended. Add egg yolks one at a time, beating after each addition until just incorporated. Do not over beat at this point. Add the vanilla until well blended. 3. In a separate bowl, beat the egg white until stiff peaks form, about 5 minutes. Get 1/3 of the egg white and fold into the cream cheese mixture until well blended. Add the remaining egg whites and fold.Divide the mixture into two. 4. For half of the mixture, fold in the dark chocolate. For the other half, mix the mocha flavoring. 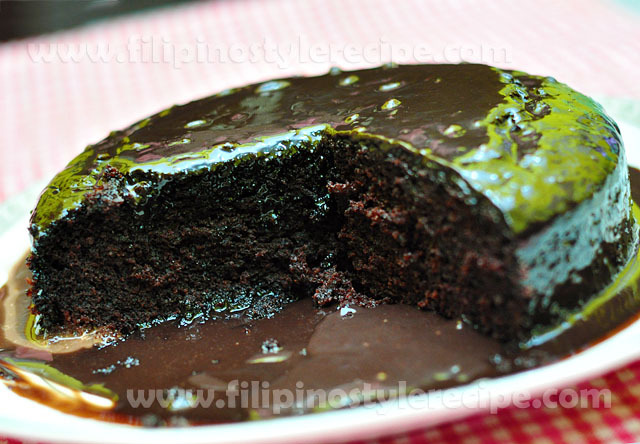 Get the crust from the refrigerator and pour the chocolate mixture. Then gently scoop the mocha mixture over the chocolate mixture to form the second layer. 5. Bake in preheated oven at 350 Fahrenheit for 50-60 minutes or until the outer layer is no longer wet but still jiggles when shaken. Note: do not open the oven to check no earlier than 45 minutes. When done, slightly open the oven and let the cheesecake stay inside for about an hour. Then remove from oven to let it cool completely before refrigerating. Garnish with chocolate shavings before serving. The most common recipes I encounter for muffins calls for blueberries. However, blueberries can be pretty expensive since they are not usually grown locally. 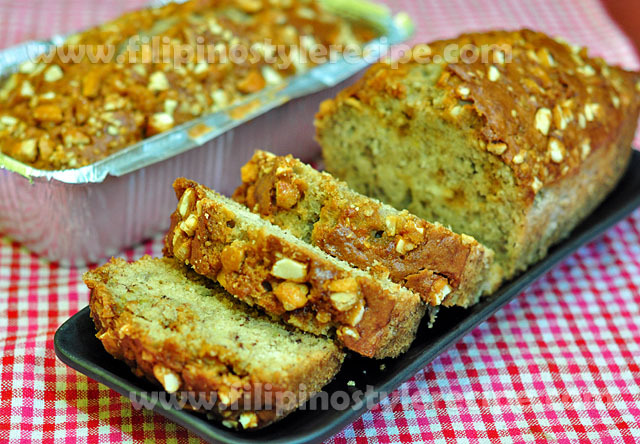 This muffin is using ripe mangoes which are commonly available in the market all year round. 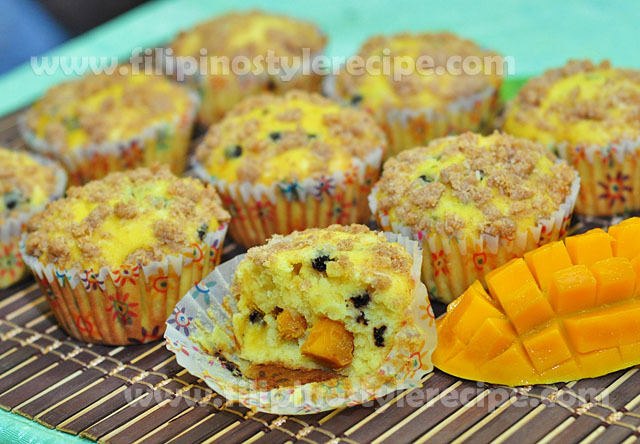 The mango gives this muffin a summery tropical feel that you got to try. 1. In a bowl, beat the butter, sugar, and salt until smooth. Add one egg and beat until completely blended. Add the second egg and beat again. 2. In a separate bowl, combine the flour and baking powder. Stir into the butter mixture alternately with the buttermilk in 3 parts. Toss the chocolate chips in flour (to avoid sinking at the bottom of muffin) then fold into the batter together with the mango.Fill the prepared muffin cups. 3. To prepare the coconut streusel, combine flour, the cinnamon, sugar, the coconut, and 1 pinch of salt in a small bowl. Mix in butter until completely incorporated into the flour. Sprinkle on top of the filled muffin cups. 4. Bake in preheated oven at 350F for 25 minutes or until toothpick inserted at the middle comes our clean. 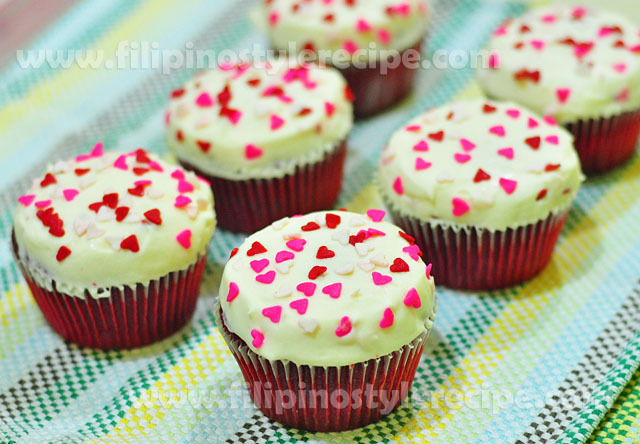 The all time favorite red velvet cupcake is very simple to do. On this recipe, I used buttermilk powder instead of my usual sour cream. 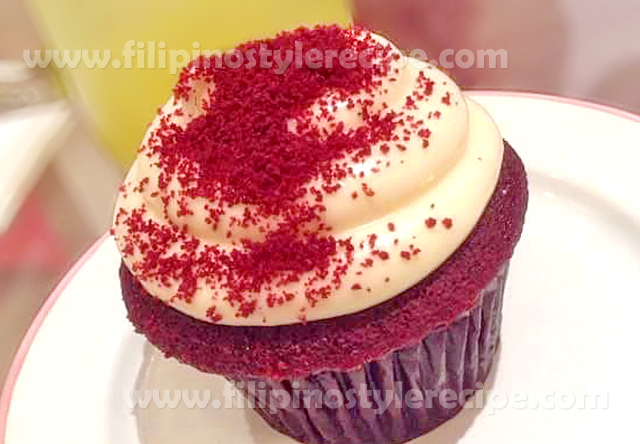 The output is still the same soft and velvety cupcake. The perfect frosting for red velvet which is cream cheese frosting is also included in the recipe. 1. Preheat oven at 350 degrees F. Dissolve buttermilk powder in water and set aside. 2. In a bowl, sift together the flour, cocoa powder, and salt.In another bowl, beat the sugar and butter until light and fluffy. Mix in the egg, buttermilk, red food coloring and vanilla. 3. Add the dry ingredients and stir into the batter until just blended. In a small bowl, combine the vinegar and baking soda. Stir and pour into the batter and fold. 4. Spoon batter into prepared cupcake cups.Bake in preheated oven for 20-25 minutes or until toothpick inserted in the middle comes out clean. Remove from the oven and let it cool before frosting. 1. In a medium bowl, cream together the cream cheese and butter until creamy. Mix in the vanilla, then gradually stir in the confectioners’ sugar. Frost cooled cupcakes and add spinkles. The sweetness of the dulce de leche is balanced with the cheese. 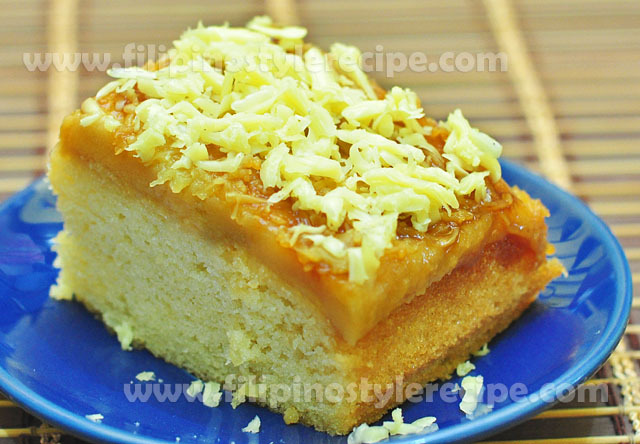 The cake base is very easy to prepare and came out soft and moist. 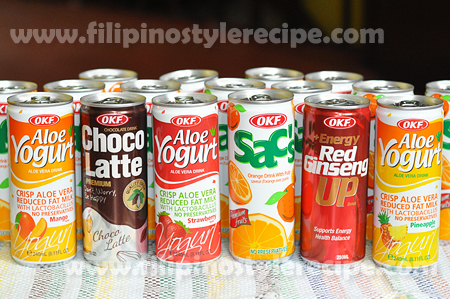 Perfect with your favorite coffee or tea. 1.In a large mixing bowl, sift together flour, sugar, baking powder, baking soda and salt. 2. Add the milk, egg, oil, lemon juice and vanilla extract. Mix until all ingredients are well blended. 3. Pour batter in 8 inch springform pan. Bake in preheated oven at 350 degrees Fahrenheit for 30 minutes.Remove from oven and let it cool. 4. In a saucepan combine the condensed milk, evaporated milk, egg yolk, and cornstarch. Mix until the egg and cornstarch as well blended.